Two people were coming up over the hill, holding hands and walking a dog. 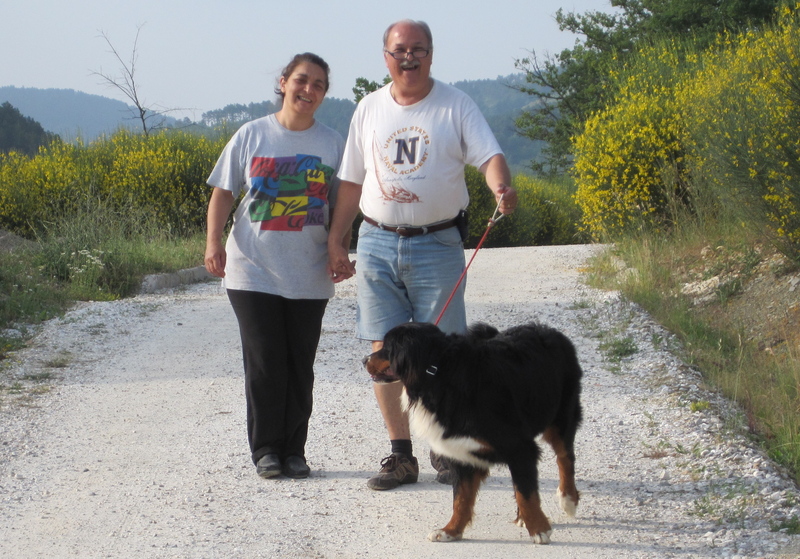 Within seconds, I realized it was Stefano and his wife Rossana out for a late afternoon stroll with Thelma. 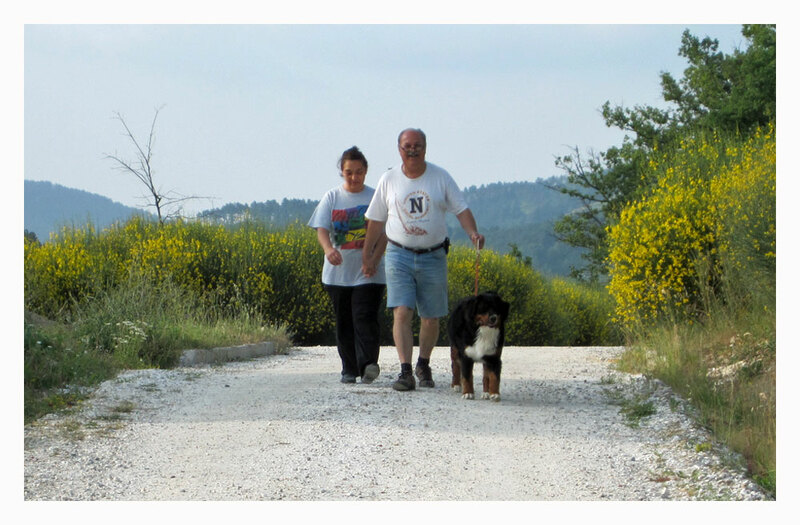 What we uncover as we walk and travel around Tuscany could never be planned. The beauty is in the serendipity and surprise. We have often compared our process to sitting under a tree in the woods. After enough time in silence, all of nature becomes more familiar and comfortable, moving ever closer. Those who decide to “show-up” do so on their own, and the messages they bring are always fresh, surprising and of-the-moment. This is not a hunting expedition with objectives in mind. Instead, it is more like being an available reporter of sorts, simply notating what comes along—what strikes a chord. It is in that space of “open awareness” that a more authentic life really shows itself. Our method depends on being open, willing, and receptive. That’s all. It’s just a service we provide because the universe has so much to say. Patting Stefano on the back saying, “ciao, buona serata, good-bye and good evening,” I walked on down the road as Thelma pulled them away in the opposite direction. They had given me a gift—a new level of clarity about this life we have chosen. I am beginning to understand that we really are just storytellers, sort of modern day troubadours. The only thing left to do was to go home and write about it. Profound truths are all around us all of the time—if we will just pause long enough to listen.